We were stuck at home most of the weekend, but we definitely made it productive. One of the things on the list was to finally finish Jack's room (i.e. get things on the walls and reorganize his stuff). 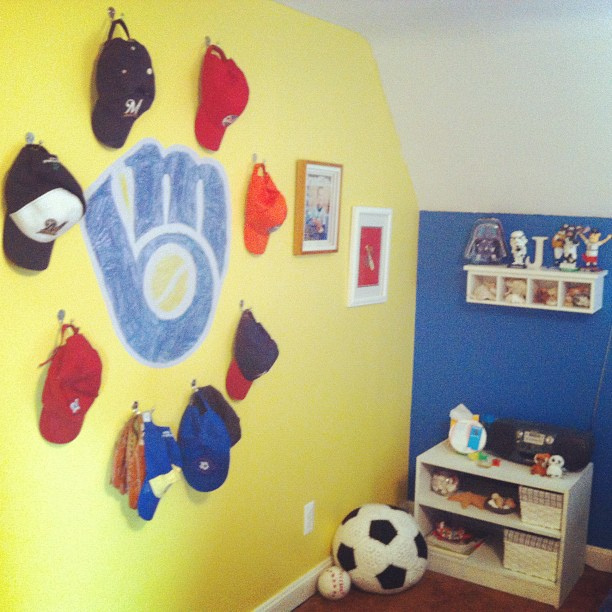 I painted the walls of his room retro Brewers blue and yellow last Spring (like 2011, last Spring). We also upgraded him to my grandparent's full size bed (which I painted last Summer). And then everything stopped! The main reason we waited to complete the room is that we really wanted to do the old Brewers logo on the wall, but weren't really sure how to attack the project. Our end result isn't the greatest quality (it's a little dark for my taste) but works perfectly. Jack drew the logo in colored pencil, I snapped a pic of it, and then we ordered a big wall decal through Shutterfly (which was actually free using my Coke rewards - my DC habit is awesome sometimes!). We added small hooks around the decal for baseball hat management and to house his old-school Robin Yount Pepsi Brewer Fan Club glove. The entire "remodel" was done almost entirely with things we already had in the house (I did have to buy the hooks yesterday though). The wall-mounted shelves were in our old house and now hold Jack's bobbleheads, shell collection, and some keepsakes (like his boutonniere and bow tie from his Uncle's wedding). His side table is an old tv stand from our apartment/college days (spray-painted white), as is the boombox (only thing that gets radio reception in his room). Baskets are from his baby days and the soccer & baseball were Christmas gifts from me. The art on his wall were mostly gifts he received through the years (that hung in his old room and were boxed up for the last year), and the ticket shadow box finally found a home on the wall. The other walls of Jack's room are blue (this is the other side of his bed) and with the big windows there wasn't too much to do. The letters above the windows are from Pottery Barn Kids and they have been there since he was a baby. I just gave them a repaint in the yellow from the accent wall. The big news on this side of the room is that his air hockey table finally found a permanent home, so Jack & the girls don't have to drag it out to play it (which they do most mornings). The entry area of the room has Jack's closet on one side and his tall dresser on the other (the top is filled with piggy banks and photos and more baseball collectibles). Jack is a bit of a pack rat, so we spent a lot of time today making some tough choices about what things to keep and which to let go (and by tough, I mean tough for both me and him!). We left a lot of wall space for future acquisitions, but I'm hoping we can keep the collecting to a minimum for just a little while and enjoy the new space. 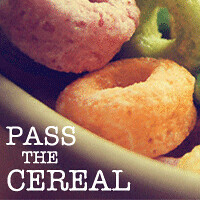 That logo is awesome! Great job, Jack. I didn't know Shutterfly did wall decals too - good to know. It really came together nice. Worth the wait! Nice work on your part as well. Your hard work and time paid off! It came together beautifully, I bet he loves it!